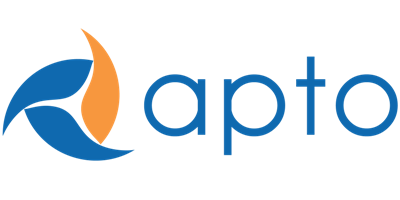 Apto’s new billing page allows you to view your invoice amounts, update your payment method, and pay any outstanding invoices. If you’re not already logged into Apto (or if it is the first time you log in), you will use your Apto log in to access the billing page. You will then be taken to the home page. If you log in with your Apto username and password and receive the following error message, you are not authorized to access the billing page. Your System Administrator will need to log in. If you are a System Administrator and you are still receiving this error message, your browser may be blocking cookies. This is common if you have multiple log-ins and/or browser tabs. Try clearing your cache and cookies and then logging in again. The homepage shows you your overall balance due, shows your default payment method with a link to make changes, and a table for outstanding and paid invoices. Any past due invoices will display in red, as well as the balance due. Once payments have been made against those balances, the amounts will turn green. You can add or edit a payment method from the home page. If you already have a credit card on file, you’ll see the last four digits display with an option to Change it. If you need to add a credit card, you’ll see an option to Add a payment method. Customers can have one payment method on file at any given time. Clicking either Add or Change takes you to the Payment Method page. Enter your credit card information. The required fields are noted with blue. When done, click the Submit button. If there are any errors, they will display in red and you won’t be able to submit until they are fixed. Once the card information is valid and you click submit, you will be taken to a confirmation screen. Click the here link to go back to the home page. To make a payment, first make sure you have a payment method saved as per the steps above. From the list of outstanding invoices, click the button next to the invoice you want to pay. You will then receive a confirmation that you’re paying a particular balance with your saved payment method. Click . You will then receive a confirmation that it has been paid and to whom the receipt was emailed. The invoice will then move to the Paid Invoices section with a $0 balance. Once you have paid all invoices, your balance will display as $0 and all invoices will display as paid.